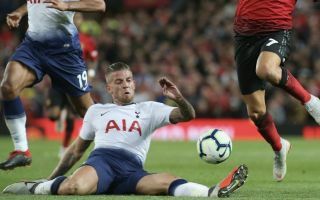 Just to rub salt into the wounds, Tottenham defender Toby Alderweireld tweeted in celebration of his side’s 3-0 win over Manchester United on Monday evening. The Belgium international put in a solid display for Spurs as they picked up a huge victory – the kind of performance, in fact, that United manager Jose Mourinho could do with from his centre-backs. As you’ll be well aware by now, Alderweireld was strongly linked with United for much of the summer transfer window, only for the Daily Mirror to claim in the last few days that the club actually gave a negative response about a deal when approached by Spurs. This certainly looks a bad move as the 29-year-old played a key part in Tottenham’s win tonight, while the likes of Chris Smalling, Phil Jones and Ander Herrera in defence for the home side were poor. Alderweireld was thrilled afterwards, however, tweeting: “A big performance, an amazing win & a clean sheet”. He can perhaps take some satisfaction in performing so well in front of the Old Trafford crowd if the Mirror’s claims United snubbed an opportunity to sign him are correct. United have now lost two of their opening three Premier League games – the most defeats they’ve suffered at this stage for 26 years.